The endoplasmic reticulum, or ER, is an organelle found in all eukaryotic cells. Within each cell it is a widely distributed membrane structure that serves as the the site for modification of proteins, manufacture of macromolecules and lipids, and the transfers substances throughout the cell. The ER is also the site of protein translation and protein folding. It is involved in other processes as well, such as the transport of those proteins that are to become part of the cell membrane (e.g., transmembrane receptors and other integral membrane proteins) and the transport of proteins that are to be secreted, or exocytosed, from the cell (e.g., digestive enzymes). The basic structure and composition of the ER is similar to the plasma membrane, although it is actually an extension of the nuclear membrane, which encloses genetic material in eukaryotic cells. The ER is part of the endomembrane system, which is the system of internal membranes within eukaryotic cells that divides the cell into functional and structural compartments, or organelles. Endoplasmic reticulum literally means "little net within the cytoplasm" (endoplasmic means "within the cytoplasm," while reticulum means "little net"). Prokaryotic organisms do not have membranous organelles and thus do not have an ER. The endoplasmic reticulum is yet another small organelle that reveals the intricacy, complexity, and harmony of the universe. Protein folding to assume the proper functional shape is a poorly understood process in which the endoplasmic reticulum somehow central plays a role. If the protein is not properly folded, it is not transported by the endoplasmic reticulum. Proteins that are transported are properly tagged with a sequence of amino acids, and when they reach their destination, the tag is removed. 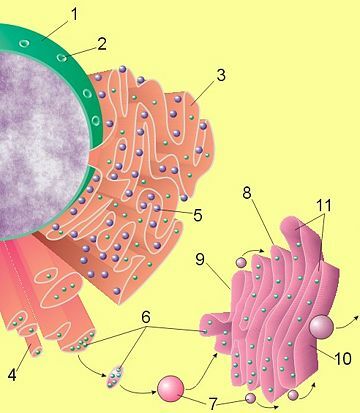 Figure 1 : Image of cell nucleus, endoplasmic reticulum and Golgi apparatus. (1) Nucleus. (2) Nuclear pore. (3) Rough endoplasmic reticulum (RER). (4) Smooth endoplasmic reticulum (SER). (5) Ribosome on the rough ER. (6) Proteins that are transported. (7) Transport vesicle. (8) Golgi apparatus. (9) Cis face of the Golgi apparatus. (10) Trans face of the Golgi apparatus. (11) Cisternae of the Golgi apparatus. The ER consists of an extensive membrane network of tubes and cisternae (sac-like structures) held together by the cytoskeleton (the skeleton or scaffolding contained within the cell). The membranes of the ER are separated by anywhere from 50 to 200 nanometers, causing the enclosure of a space, the cisternal space (or internal lumen), from the cytosol (the internal fluid of the cell). This space acts as a gateway. Parts of the ER membrane are continuous with the outer membrane of the nuclear envelope, and the cisternal space of the ER is continuous with the space between the two layers of the nuclear envelope (the intermembrane space). Parts of the ER are covered with ribosomes, which assemble amino acids into proteins based on instructions from the nucleus. The rough appearance under electron microscopy of the ER and ribosomes led to their being called rough ER (RER). Other parts are free of ribosomes and are called smooth ER (SER). The ribosomes on the surface of the rough ER insert the freshly produced proteins directly into the ER, which processes them and then passes them on to the Golgi apparatus (Fig. 1). The rough and smooth ER differ in both appearance and function but are contiguous with each other. The rough ER (RER) manufactures and transports proteins destined for membranes and/or secretion. On the ribosomes attached to the cytoplasmic surface of the RER, proteins are assembled and released into the lumen. They then undergo modifications. In leukocytes, a type of white blood cell, RER makes antibodies while in the pancreas, RER produces insulin. The smooth ER (SER) has functions in several metabolic processes, including synthesis of lipids, fatty acids, and steroids, metabolism of carbohydrates, and detoxification of drugs and poisons (in the liver and kidney). In the brain, SER produces male and female hormones. Striated muscle, which plays a major role in muscle contraction, contains sarcoplasmic reticulum (SR) instead of ER. It is a modified form of ER that wraps itself around each muscle fiber. The sarcoplasmic reticulum contains large tubules, which release large stores of calcium when the cell depolarizes, and terminal cisternae, which collect calcium. The endoplasmic reticulum serves many general functions, including the facilitation of protein folding and the transport of proteins. Correct folding of newly-made proteins is made possible by several ER proteins, including protein disulfide isomerase, calnexin, calreticulin, and the Hsc70 family and peptidylpropyl isomerase family. Only properly-folded proteins are transported from the RER to the Golgi complex (another organelle) for further packaging and transport. Secretory proteins are moved across the ER membrane. Proteins that are transported by the ER throughout the cell are marked with an address tag called a signal sequence. The N-terminus, one end of a polypeptide chain, contains a few amino acids that work as an address tag. These are eventually removed when the polypeptide reaches its destination. Proteins that are destined for places outside the ER are packed into transport vesicles and moved along the cytoskeleton toward their destination. The ER is also part of a protein sorting pathway. It is, in essence, the transportation system of the eukaryotic cell. The majority of ER resident proteins are retained in the ER through a retention motif. This motif is composed of four amino acids at the end of the protein sequence. The most common retention sequence is KDEL (lysine, aspartic acid, glutamic acid, and leucine). However, variation on KDEL does occur and other sequences can also give rise to ER retention. It is not known if such variation can lead to sub-ER localizations. There are three KDEL receptors in mammalian cells, and they have a very high degree of sequence identity. The functional differences between these receptors remain to be established. Insertion of proteins into the ER membrane: Integral proteins must be inserted into the ER membrane after they are synthesized. Insertion into the ER membrane requires the correct topogenic sequences. Glycosylation: Glycosylation involves the attachment of oligosaccharides, or short chains of sugar molecules, to proteins. Disulfide bond formation and rearrangement: Disulfide bonds stabilize the tertiary and quaternary structure of many proteins. Centre for Cancer Education. 1997. Endoplasmic Reticulum Centre for Cancer Education: The CancerWEB Project. Retrieved November 18, 2007. This page was last modified on 3 April 2008, at 20:09.